Vegetarian Cookster: Get Ready for Crockpot Week! Besides, I don't use my slow cooker nearly enough as I should. Mainly, I use it to make my veggie chili. But, I know there's a whole world of slow cooking out there. It's time to become part of it. I've picked out three recipes and purchased ingredients for them. I'm making the first meal tonight (actually it's cooking as I type!). Check back tomorrow and the remainder of the week for stew, soup and casserole recipes a la crockpot. Wow, I used my Crock Pot last night to make Two Mushroom Barley Soup from Robin Robertson's Fresh From the Vegetarian Slow Cooker. I'm not in love with this cookbook for two reasons: 1) The cooking times seem to be off in that the two recipes I've made have resulted in food caked on to the sides of the Crock Pot and 2) Almost all of them require prep as opposed to just throwing everything in. That being said, the soup, which turned out as more of a risotto, tastes great! Have fun w/ your Crock Pot adventures! Oooo, I'm looking forward to crockpot week! 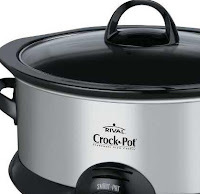 I love my crockpot but don't use it enough. Gimme some inspiration! I love my slow cooker, especially as the weather gets colder!